Firmness is the faculty which stands for determination, and persistence, for the connection between principles and acts, for perseverance, determination, resolution, and stamina. A strong Firmness may cause stubbornness and inflexibility. A negative Firmness stands for an insipid character, passivity and lack of decision-making capability. 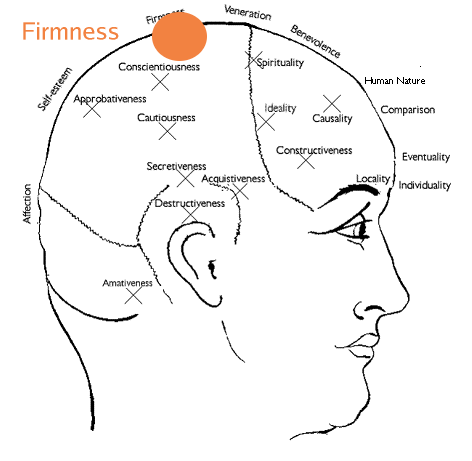 Firmness is located on top of the skull, just behind the perpendicular line drawn from the aural conduct upwards. This line separates Firmness and Veneration.